We can see the progressive tendencies of the band Enslaved really take over on this album and the songs show nods to progressive rock and more interesting song composition. 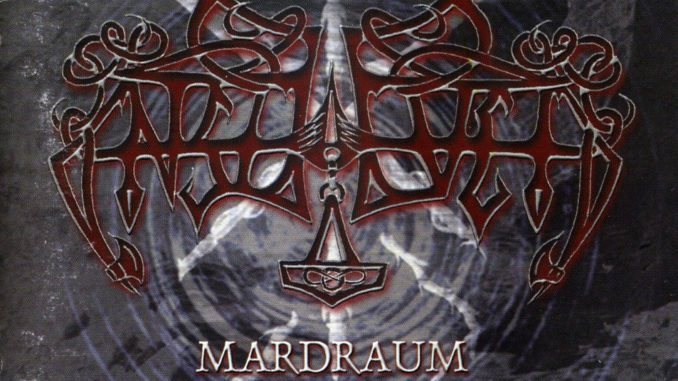 The album starts off with a band on “Larger Than Time – Heaver Than Night” or “Storre enn Tid – Tyngre enn Natt” which features several epic twists and turns to start the album off. It has moments of staccato picking that stand out and make the song easily one of the best to be found on the entirety of Mardraum. The riffs are very open ended and ingenious sounding leading to open ended musical pastures that segue nicely from one to the next. We can sense that this is near the beginning of where Enslaved starts to experiment more greatly with their sounds and it results in an outstanding album that shows promise for the future. They would even continue to refine their explorations towards the culmination of the excellent work Vertebrae which has a slightly simpler, but undeniably beautiful type of sound attached to it. Both show the manners in which a black metal band can delve into different musical territories to create something that is musically interesting, but at the same time accessible towards the listener. Mardraum features many high and low points that help to create a work that has the ability to progress and compel at the same time greatly. Overall, the album is a great one that shows Enslaved’s ability to entrance you with unique and thoughtful approaches that work well within the black metal genre and bring out the best of their capabilities. Excellent work by a band that has taken a grasp upon the progressive black metal genre in recent times.